When I started yoga about 11 years ago in my final year of art school - I genuinely knew nothing about the lineage, philosophy or practice and certainly had no idea how it would permeate, in-fact saturate so many aspects of my life in the years to come. Wow, what a ride but then it could never be any other way to how it is! Since then there are times when I have practiced more actively with gusto and times when toe didn’t poke the mat for weeks. After my first foundational 200 hour teacher training I became a dedicated self practitioner of the same lengthy ( 2 hour!) Sivananda sequence every morning and most evenings without fail . After a while the beginners keenness started to fade - 5am rises became 7am became maybe I’ll skip today, and tomorrow and head to the pub with mates. Looking back I’m not surprised this happened- the regimented and repetitive nature of what I was doing, of what I had learnt to do was ironically not in sync with my natural, social and work life rhythms- I was out of balance. Instead of listening, appreciating and nurturing my body to support life - I was pushing it to the limit, experiencing a backlash and then harbouring guilt for not doing something i felt i should- which made starting again all the more difficult. So that which was making me more flexible in body was not doing the same for my mind! I see echos of this all over the wellbeing community and growing industry- ‘be the best version of you’, ‘your higher self’ and ‘manifest your dream life’. Though nicely encouraging in sentiment it is important to remember that some of this is the hard sell - suggestive marketing that promotes a continuous search for an ideal lifestyle, an ideal self through an idealised image. This is a misconception. Yoga has never been about outer ideals, yoga is within embracing the NOW. And it is this now, in this moment that we find perfection, it is the only one that is real! This is a feeling a state that is within you- heighten your capacity to love to reveal that everything is at its highest when you choose to recognise it as being so. And that means becoming adaptable and learning how to swim in the current of life with awareness - staying steady in your connection to your body, mind and heart. How do we keep consistency and love in our yoga practice so that it really serves us throughout the ups and downs of life? . Yep- the breath comes in at number one! If nothing else, spend some time each day to consciously breathe. Honestly you’ll never get bored of breathing as every breath is a fresh moment to be absorbed in. Not just being aware of the breath and focusing on the inhale and exhale but allow your mind to rest in the embrace of the breath, enjoy the feeling of breathing and get curious about it! Appreciating breathing and becoming sensitized to its nuances- changes in the flow: temperature, speed, length, texture, breadth, duration, nostril and how you act and react in this daily breath is a profound life changing practice and available to everyone at any moment. Quality of breath is directly linked to state of mind. The mystic science of brain breathing is a called Swara Yoga and is almost forgotten in modern yoga. Swara Yoga differs from pranayama both direct us to control the breath, yet in swara yoga the focus is to attune to the rhythms of prana resident in the breath. Imagine how much we could relax into a meditative state if we released the control and truly became participant in the intelligence of our pure breath. The paradox here is that though variety is the spice of life , some repetition and simplification certainly is good for us. Simplifying gives us room to feel what’s going on inside when every day we are bombarded with crazy over powering stimulus from our environment. One thing I have noticed from teaching is that too much avant garde creative sequencing can be confusing for students- especially when they come to class to decompress, and this could lead to feelings of not being capable , unconfident or ungrounded = resulting in no yoga practice! By providing space to feel through simplification you get to work deeply into you which allows us to discover , acknowledge and release anything that is trapping us. My suggestion would be to repeat simple movements several times, with a simple focus of breath appreciation ( see above). This can be challenging too as often we have a tendency to try and fill space with thoughts and actions - with an aim of ‘progressing’ or ‘impressing’ rather than just being. Once we have reconnected to our foundation through simplicity - we then have space for creative energy to naturally flow. The sanskrit term for contentment is Santosha- you may of heard this in class or through reading. Contentment isn’t just something that happens when everything is going our way but a way of being we can invite in or even learn. Santosha is one of the niyamas from the eight limbs of yoga from The Yoga Sutras of Patanjali - in the translation and commentary by Sri Swami Satchidananda contentment means “just to be as we are without going to outside things for happiness. If something comes we let it come. If not it doesn’t matter. It is to neither like, nor dislike.” Enjoyment is part of contentment, which is perhaps more subtle than being happy- and it is a vital part of spirituality. To be content, grateful and learn from whatever life has to offer us, rather than suffer from attachment, anticipation or coveting. There is a reason why yoga asana classes traditionally begin and end with Shavasana - corpse pose. Here we sink into the ground opening to stillness. Not moving the body, relinquishing action, relaxing into the wave of the breath. This is a space of integration which also allows us to transition between two situations - i.e from a busy bus journey to beginning the yoga class, pose to pose or shifting fatigue into feeling refreshed. You need time to digest your yoga practice just like you do a meal. Because stillness and seeing the self is challenging, we don’t often spend enough time integrating- allowing our experiences to sink in, move through or flow out. Doing this helps us become more balanced and less reactive. Integration may also come in the form of svadhaya ( self study)- recognising how certain actions have made you think or feel, becoming more aware. Giving yourself space to respond to your experiences through journaling, creative writing, art, music, meditation and taking rest is also a great way to integrate your yoga practice into your life, and you into yoga. Meditation is a full integration of heart. body and soul in moment to moment experience. 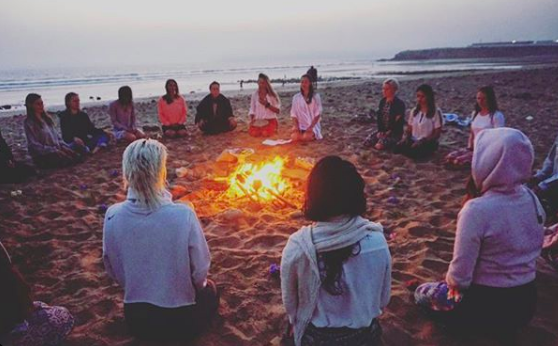 Community- known as sangha or kula in yoga terms is a place to share, support and talk spirit and beyond with those who share the love for this journey. A translation of kula is community of the heart. It can be a motivation and inspiration. This can also include your local area community, your friends/family community or finding people who you can do something fun with that brings lightness and laughter into the heart- feelings of connectivity. Being involved in community also offers a direct path to spread some peace, well being or give back. Rituals can be one step simple or exquisitely elaborate. Ritual can be universal, communal or individual and often act as a portal to help us acknowledge moving into sacred space or practice. Learning simple rituals from traditions that inspire you or making your own is very nurturing, respectful and part of the path of devotion, bhakti yoga. The creation and maintenance of an alter space is a wonderful ritual act. The difference between ritual and simply habit or pattern is the conscious placement of intention and awareness infused with love within the act. It may be something that you do daily or to mark a special occasion or passage from one pace to another. Ayurveda the sister science of yoga, contains many rituals for maintaining the health of the body- and having your a self care ritual is a wonderful way to honour and love your body. There are many simple rituals you can incorporate into everyday living to live more consciously and with more contentment. Saying your own grace before a meal or giving yourself space to move gently into the day upon waking. Namaskars ( such as the sun salutations) and prostrations ( bowing to the earth) are a form of moving devotion and flowing ritual using the body that we often explore in yoga class. Bring joy in. Be playful, explore. Don’t take yourself too seriously but be not distracted. Anything can change in an instant. Some days will flow more naturally than others, some days will feel well clunky. Allow yourself to feel what you feel and enjoy feeling it, dive into it, work with it. Infuse each day with love, and if you feel reactive, triggered, resentment, hatred, dislike- feel that and feel love too. Everything comes full circle. Love the clunky days and give yourself extra love through listening when you need it. Get into nature, wild space or the park if your in the city and run around like a child, jump over puddles and swing your limbs around. Bring all of these aspects together whenever you can for total refreshment and a reminder of the pure love and joy that is our true nature. Very top: Learning to headstand in Kerala 2010. Above left- ritual objects for a hindu wedding puja in India. Above right- sacred circle from Real Flow Teacher Training 2017. All photos my own.